It might be just a coincidence, but I keep coming across vintage tin toys lately. Like these really cute kitchenware I found in Suzanna's shop (so much more to find there, you should definitely have a look around!). Did you play with such, retro toys as a child- or even as a grown up, hehe- or would you rather collect them as a vintage statement decorative objects? Tin teacups and bowls here and there. 2 comments on "Tin toys"
Too vintage for me!! Have a nice weekend. 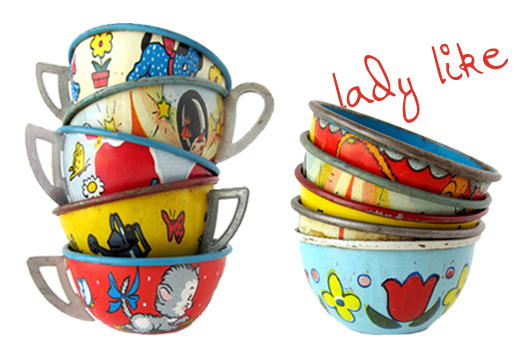 These tin cups are divine! Totally adorable - in the 70s I certainly played with tin toys, all very sturdy & brightly painted. Thanks for uploading these, they are so cute.